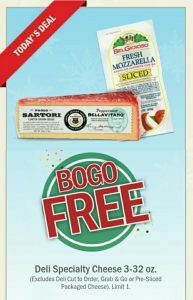 Meijer’s December Daily Deal for today is Buy One Get One Free Deli Specialty Cheese 3-32oz. You can only load this coupon and pick up your cheese today, so don’t wait! Click here to load the coupon to your Mperks account.